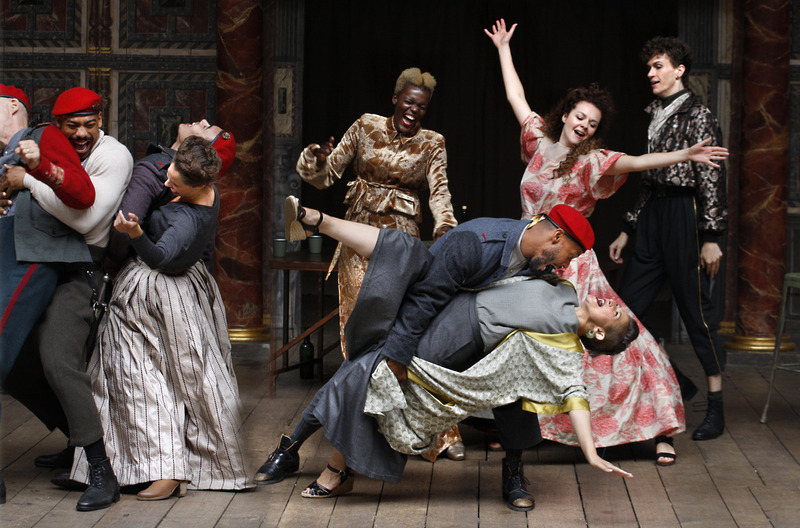 Our guest reviewer, Jill Barlow, sees the new production of Shakespeare's Othello at Shakespeare's Globe, directed by Claire van Kampen (who also wrote the music), designed by Jonathan Fensom. Mark Rylance stars as the treacherous Iago, with Andre Holland as Othello and Jessica Warbeck as Desdemona. 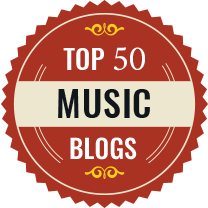 I first had the privilege to meet Rylance (Globe’s Artistic Director) face to face in August 2000 when interviewing his wife Claire van Kampen, Director of Theatre Music, behind the scenes at the Globe myself as Theatre music critic. When I asked him what was the role of music in the plays his considered reply was :- ‘The music is replacing lights and sets’. This classical austerity of approach lasted through to circa 2012 with his much acclaimed Twelfth Night and Richard III, but with his subsequent sideways move into the illustrious tv drama ‘Wolf Hall’etc. In his absence, things became more relaxed in Globe productions, I understand. However with Othello this season he has happily returned to ‘treading the boards' with his talented wife, Claire van Kampen as Globe director (and composer) and so have I returned as well to help celebrate the occasion and what seems a return to former classical austerity of approach on stage here. However as Claire explains in the programme notes:-‘normally as composer I’d be making all sorts of suggestions to the director (now herself !) devising all sorts of interesting music cues, but with this production we’re barely having music other than that which Shakespeare has called for in the play; when Cassio gets drunk, the ‘Willow song’. We don’t have inter scenic music because the scenes are going to move extremely quickly –‘Righto say I, so over to husband Mark Rylance and his antics non-stop as Iago, much more fun'. They say ‘everyone loves a villain’, but didn’t Shakespeare write overtones of treachery and skulduggery in Iago, not Chaplinesque jumping about clad in red beret and ill-fitting cloth trousers too short, which is what we got? 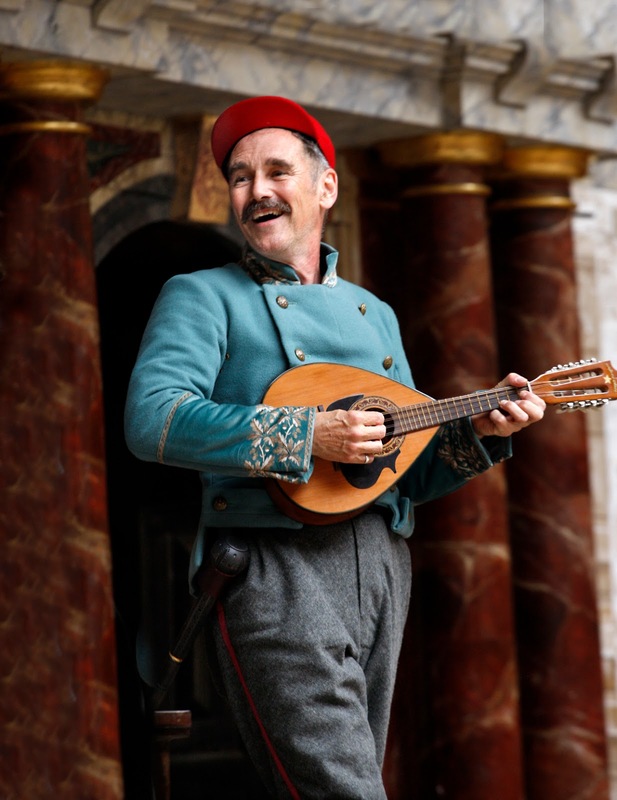 The audience gleefully lapped it all up, with roars of laughter as Rylance threw asides galore to the groundlings at his elbow on all sides of the stage where indeed he ‘owns the space’. 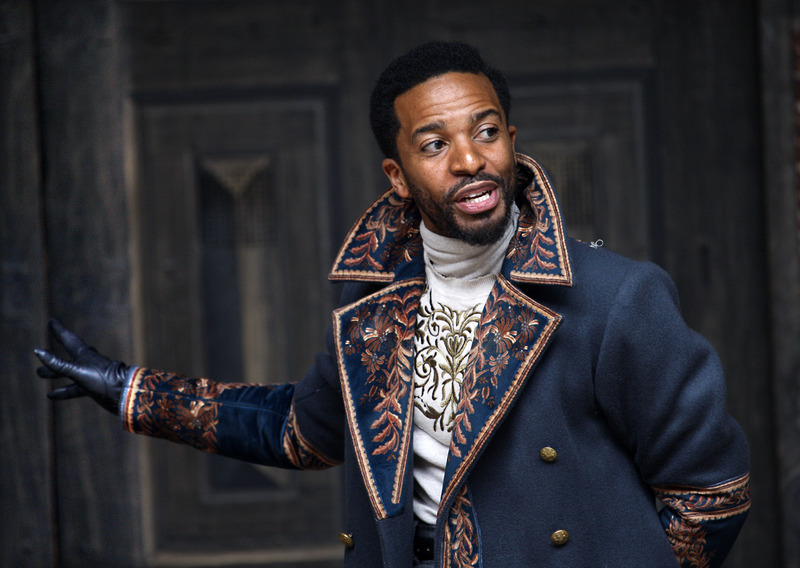 Of the other main characters I was particularly impressed by Andre Holland, in the title role as Othello played with due integrity even when his faith in Desdemona’s constancy is so cruelly undermined by Iago. As he starts to crumble under the pressure his confusion is well portrayed and final despair rings true. An actor to watch in the future - he could go far I feel. Desdemona (Jessica Warbeck) shone forth with enormous integrity and impressive innocence and composure to the end. 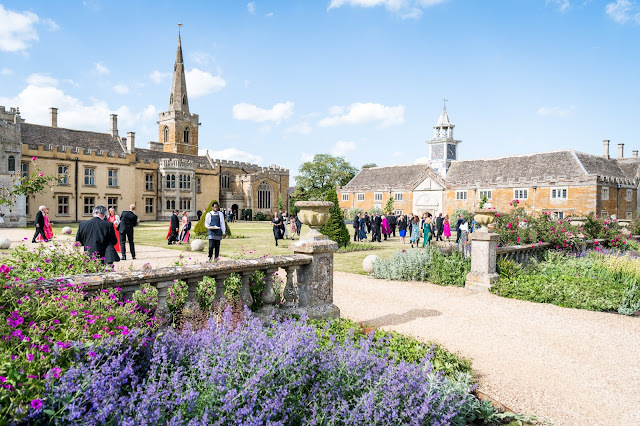 And even the music came up trumps after all – here and there, with deft touches of the Willow song Claire mentioned, intermittent dance and balletic flourishes, on stage, cornets, trumpets percussion and chorus, and Desdemona’s doleful song. 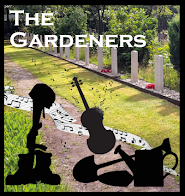 The final dirge with as van Kampen describes, 'a lot of people dead on stage’ made an apt conclusion to this, one of Shakespeare’s most famous tragedies.